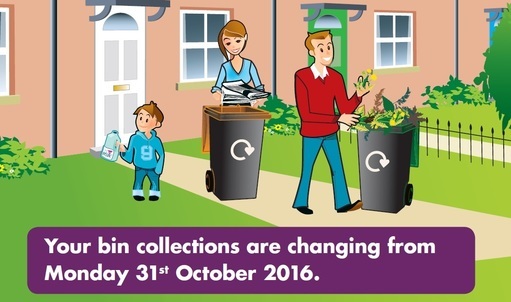 From Monday 31st October your black lidded rubbish bin will be collected every other week. This means all bins will be collected on an alternate weekly basis: one week we'll collect your black lidded rubbish bin, and the following week the orange lidded recycling and green lidded garden waste bins will be collected. Your bin collection day may change. Look out for your leaflet which will arrive during week commencing 24 October. It will detail your new collection timetable and give lots of information on how you can recycle more and reduce waste. Flats that share a large 4 wheeled bin will continue to have their household waste collected on a weekly basis. The Council will reassess collections for these properties in the coming months. Trade waste and recycling collections for businesses provided by Bedford Borough Council will remain unchanged. Garden waste collections will stop at the beginning of December and resume at the beginning of March. In addition, the option to use green sacks is no longer offered. However, residents currently using green sacks can request a green lidded garden waste bin for the disposal of their garden waste. The changes come as Bedford Borough Council faces further government funding cuts which mean savings of over £27 million need to be made from its annual budget by 2020. In addition, the £3 million government funding supporting the continuation of the weekly waste collection service has ended this year and is not being replaced. Savings from the changes to bin collections will be used to protect other essential Council services such as care for the elderly. Think you might need extra space? The Council can provide additional bin capacity to those households with special circumstances e.g. for people with medical conditions or large households (of 6 or more permanent residents). One free roll of orange sacks can also be provided free each year to any household. You may also wish to take advantage of the Council’s subsidised home composter scheme or opt to pay for an extra green lidded garden waste bin. Go to www.bedford.gov.uk/binchanges to find out more or to place an order. Visit www.bedford.gov.uk/binchanges where you'll find details about the changes, a list of frequently asked questions and lots of tips on how to recycle more and reduce your waste. And look out for your leaflet which we're sending direct to every household affected by the changes later this month.